Since this is a series of articles, we need a dataset to play with. We will use a new version of the Movie Database used in Frank Kane's tutorial. Please visit the grouplens website and download the small "MovieLens Latest Datasets". As you can see, the user with the id 2 gave a 4-star rating to the movie with the id 3809. In this piece of data, we have one movie with 3 stars rating, five movies with 4 stars rating, one movie with 4.5 stars rating and one more movie with 5 stars ratings. Create a new Scala → sbt project as shown in Setup Scala on IntelliJ IDEA Step #6. Use the name Movie Ratings Counter and make sure that you have selected JDK 1.8 and Scala 2.12.x. Open build.sbt file and append the following dependency definition to it. After the modification, if IntelliJ asked you to Import Changes or Enable Auto-Import, click on Enable Auto-Import to import all the changes we made automatically. name := "Movie Ratings Counter"
Expand the src → main → scala folder, right click on it, and create a new package named com.javahelps.spark. Right click on the newly created package and select New → Scala Class. In the appeared dialog, enter the name: MovieRatingsCounter and select the kind Object. Finally, click on OK to create the Scala object file. Step 6: Pay more attention from this step. 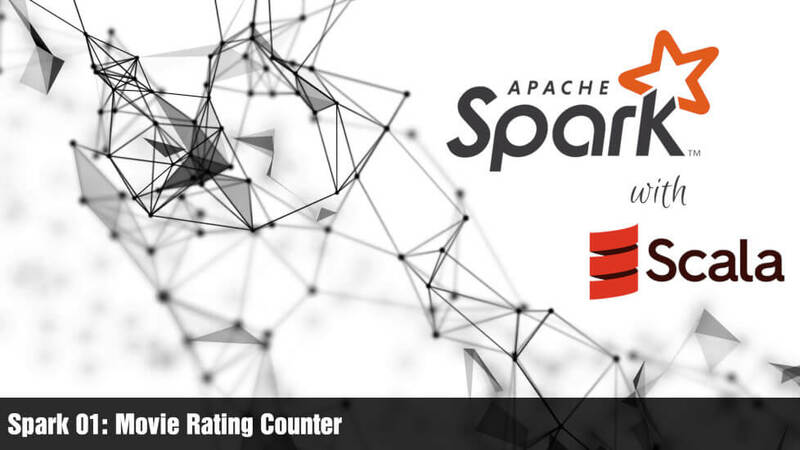 The first argument of SparkContext informs Spark to use all CPU cores available in your(local) computer for the upcoming operations. If you want to allocate only 2 cores, you must modify this as local. The second argument is your Spark application name which is MovieRatingsCounter in this example. Read the ratings.csv file as a text file. In this code, I read the file from /tmp/ml-latest-small/ratings.csv path. Depending on where you extracted the ml-latest-small.zip file, your path may differ. The ratings.csv has a string header which is not necessary for our computation. Remove the header by extracting the first row from the data and by filtering the rows. Now map lines of strings to rows of floats and count the number of occurrences of each unique values. The countByValue function returns a Scala Map[Float, Int]. You can run this code and check the ouput. If you ran the code in the previous step, you might notice a lot of INFO logs printed on the console and made the output clumsy. You can fix it by setting the level to the logger. In the following code, I have inserted a Logger.getLogger("org").setLevel(Level.ERROR) command to inform the logger to log only error messages. At the same time, I also want the output to be sorted by rating. Therefore, I have replaced the println(result) command by a Scala code to sort the map and print it line by line. You can interpret this output as there are 1370 movies rated 0.5 stars and so on. Good job! You have successfully created your first Spark application which reads a CSV file and counts elements and prints it in a decent format.